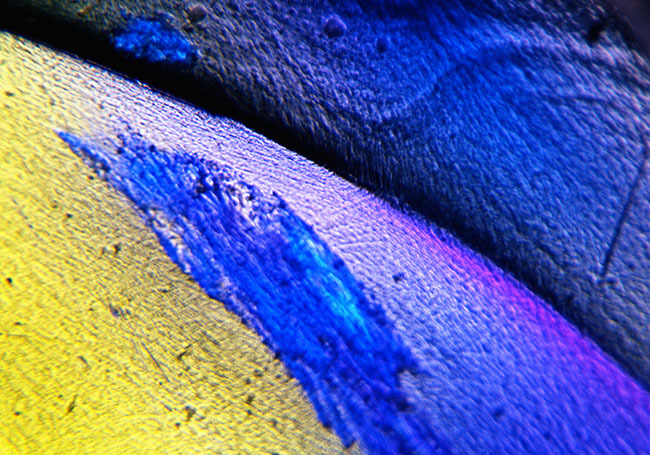 This is another image from my fine art micro portfolio. As with most of these images it’s named for a part of speech, rather than called light refracted through a plastic ice cube. I think that the title Vocative is much more, well, evocative. I enjoy the process of looking through the microscope and other special micro equipment to find the beautiful and the unexpected. You can find worlds in a piece of glass or an insect wing. This image was made with bellows and a 28mm Schneider Componon lens. I think the aperture on the lens was about f16, but of course the working aperture was much smaller. The digital camera makes it easier to work with microscope lenses and other special optics. A few companies, like Zeiss and Schneider have made special optics for the purpose of photographing microscopic images, but there are actually many choices. You can use the objective from a microscope, with out the rest of the scope, or you can use an enlarger lens. Some of the best lenses are older fixed focal length Nikon lenses, like the 35mm f2.8. Smaller focal lengths give greater magnification, so a wide-angle lens can be a great choice. If you’d like to buy a print of Vocative use the PayPal link below. You’ll get a print mounted an matted to 16X20-ready to pop into a frame. Why not order one now? I’m offering a class in working with micro equipment on February 28, just a few more days. You can sign up for just $175. Unlike so many photo safari trips you can go back to the land of the very small again and again. The equipment is not expensive, and this is an opportunity to have a guided tour. This workshop will give you the keys to unlock the doors. I hope you’ll join us! Use this link to find out more about this workshop and to sign up! I found it difficult to title this series of images because the images are about light and color rather than images of things. I thought that Plastic Ice Cube #1 and #2 and so on were not really very good. Finally I decided to use language terms for the images. I learned most of these terms in Latin classes. Eventually I branched out and so this title is the name of the person that wrote my Latin textbook. The technology I used to make this image was very complex because I was using large format film to get the kind of resolution I wanted. A smaller film format, such as 35mm film, would have been too grainy. I used a 63mm Zeiss Luminar lens on the camera. The lens was almost three feet from the film. Of course there was no built in meter on large format cameras, so figuring exposure was quite complex. In addition to figuring how much light was actually coming through the plastic I had to compensate for almost eight stops of bellows extension. The exposure was several minutes long. The film image is about 20 times the size life size, and any enlargement is bigger still. Digital cameras have made it easier to visit these kinds of extremely close images. Of course there is still a great deal of confusion about how to do this. I’m offering a Workshop on February 28 that will be a sort of tour of micro photography. You can find out more, and sign up, at this link. Of course you can order a print of this image, about 12 inches wide using the link below. This image will be about 80 times life size. A version of this image is also in my book B-Four, however the current image is a significant re-interpretation. I really like the process of re-visiting my images that these blog posts have given me. Even though this image has changed, I hope you’ll consider purchasing the book. I like to explore color and shape. The micro-environment enables me to do this without being involved is shooting things. 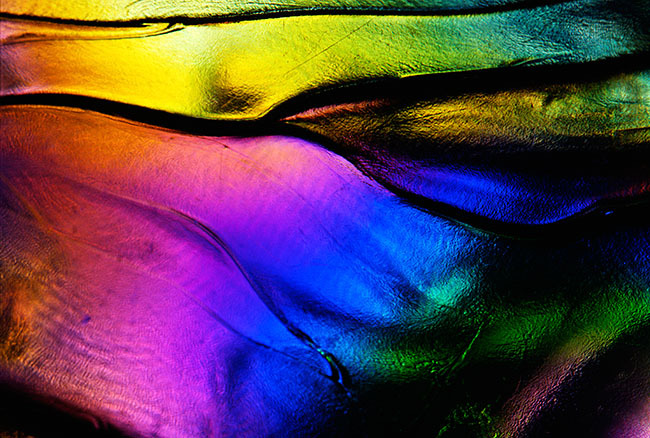 This image is about color, shape and texture; it doesn’t matter what the subject is! The image has an otherworldly quality, which is what I was looking for. This belongs to a group of images I call Parts of Speech, and all have names drawn from Latin grammar. This is an image of light displayed by a plastic ice cube captured with some specialized equipment. I used to say fake plastic ice cube, but it’s real enough; they’re made as props. Anyway certain materials can be made to diffract light in interesting ways, and this is much more interesting if you can get really close to the subject. In this case I used a Toyo view camera with about two feet of bellows. I used a Zeiss 63mm Luminar as the lens. The lumiars are a special series of lenses Zeiss made for extreme micro work. This was pretty difficult to do with any film camera, but especially difficult with a view camera that didn’t have any meter. The area I photographed is much smaller than the image on the film, and of course much, much smaller than it is here. The image will print to at least 20X30, which would be more than 100 time life size. 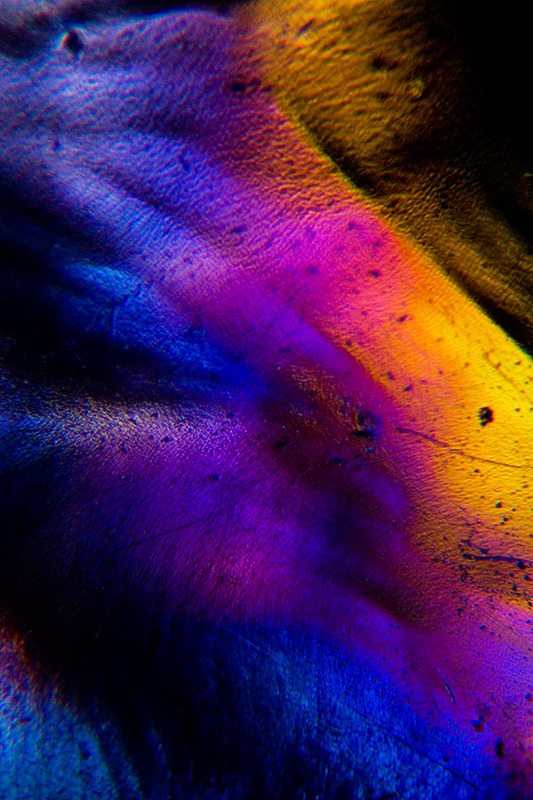 It’s much better to do micro-photography with a digital camera than with a film camera. First the resolution of a digital camera is better than film would have. For technical reasons digital capture is better than even large film, say 8X10 inches. In addition it’s easier to control exposure, because the meter is in the camera and because you get instant feedback. I’ve mentioned various resources for micro photography in recent posts: http://siskinphoto.com/blog/?p=2988, http://siskinphoto.com/blog/?p=2978 and http://siskinphoto.com/blog/?p=2954. I hope you’ll take a look if you haven’t already. I’m thinking about offering a workshop about shooting micro images. This would enable us to go far beyond what a standard macro lens can do. Most macro lenses go far enough to make the image the same size on the sensor it is in life. There is an interesting, and very affordable, toolkit that will enable you to go so much further. It’s quite possible to shoot 80 times life size onto the senor, and then multiply that by the size of the print! I hope to have detail of this workshop in the next two weeks. Please let me know what you’d like to see in this sort of workshop; anything from a one day demonstration to a couple of days with a microscope included! I’d like to do this during winter, when it’s good to have indoor subjects to explore. Keep an eye on my workshop page for updates. This image has wonderful color and depth. 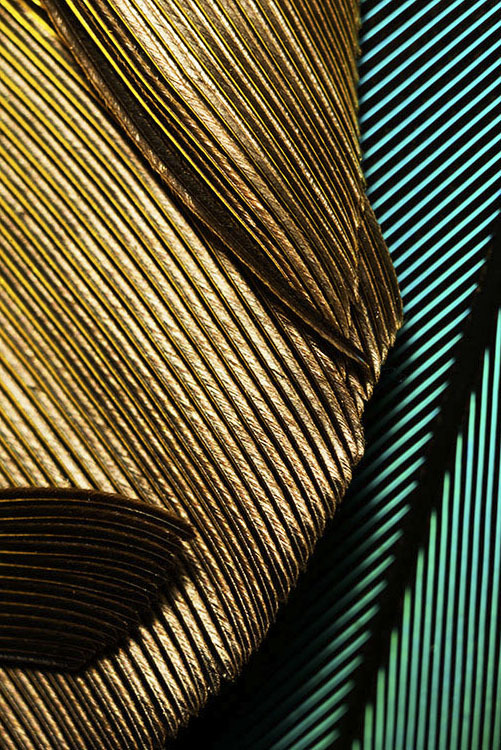 I like the pattern of the feathers and the contrast. The dark feathers near the top of the images help to give a relatively flat subject a sense of depth. It interests me that, although the lines lead away from the center of the image, my eyes keep coming back into the image. Most micro images don’t have a specific orientation, especially because I’m usually shooting straight down. I noticed that I didn’t like either landscape presentation of the image, but I do like both portrait presentations. I’m including another version of the shot upside down. This upside down version was the way the computer first presented the image. 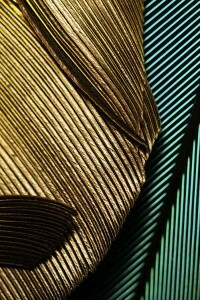 This is the second image of the Parrot feathers I’m putting on the blog. 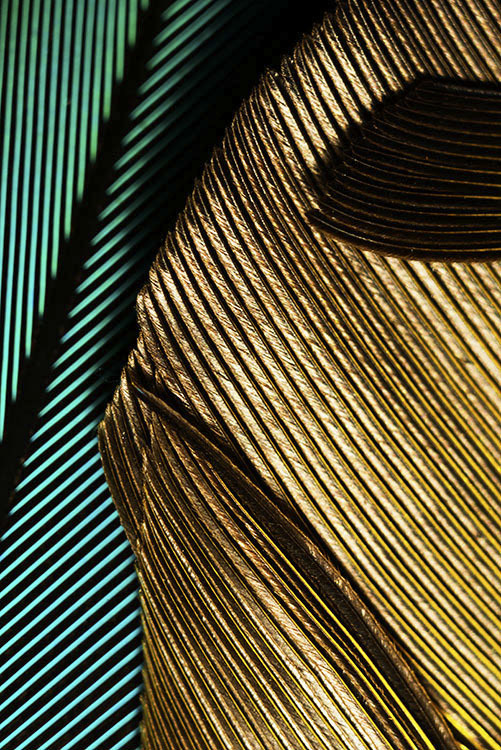 This image was made in the same session as the Parrot Feathers #1. Please check out this link for more about how these images were made. I have a lot of small things I use as subjects for micro photography. As I mentioned in the entry for Parrot Feathers #1, each time I work with very small subjects it’s like a journey. I may have ideas about what I hope to see, but I’m always open to surprises as well. I know that many people enjoy working with macro lenses outdoors, but I’m often surprised at how few people want to go even closer with some more specialized equipment. This equipment is not that expensive but it can be difficult to find. You might want to check this article I did for Photo Techniques, it has more information about micro photography: www.siskinphoto.com/magazine/zpdf/microscope.pdf. You can access many of my articles about photography at: http://www.siskinphoto.com/magazinearticles.php. As I’ve mentioned this blog is part of a series of entries about my fine art images. I’m doing this series as part of an update for the fine art pages on my website. I hope this series will make my images more accessible, both on line and as prints. If you buy a print of this image you can choose to display it in any orientation you would like. If you’d like to buy a digital print of this image, mounted and matted on archival cotton rag board, please use the PayPal link below. The image will be about 13 inches wide mounted on 16X20 board. The price includes shipping in the United States, for other countries please ask first. I’m going to be using my blog to add information about images to the fine art pages of my site. This part of the site isn’t functioning yet, but it will be. These posts will enable me to put up information about the shot and to add details about buying prints. I think it’s very useful to talk about the details of creating specific images. I hope to hear from you about this-use my e-mail to let me know: john@siskinphoto.com. Of course I hope you’ll also want to buy some prints. I’ll be offering more types and sizes of prints in the future.